Do you have any boundaries? I am sure you would say you have. I have crossed quite a few people's boundaries in my lifetime. Sometimes I step on people's toes, sometimes I find myself speechless after a barrage of words being thrown at me due to the crossing of certain boundaries. Most of the time, I feel myself eating humble pie for not knowing how to keep within the boundaries of others. You see, when I was growing up... I never knew much about boundaries. Where I was not supposed to go, I have been there. I never just interact with people of my age. When I was 12 years old, I chatted with people who were in their 20s and 30s. I could carry a decent conversation and never felt out of place. I never knew such a thing as boundaries. When I was 16 years old, I was counselling people I never met over the phone about relationship issues. Perhaps it was the fact that I didn't know any boundaries, I had some regrets over decisions I made over the years. I used to think boundaries would restrict the freedom to speak and the catharsis of sharing. 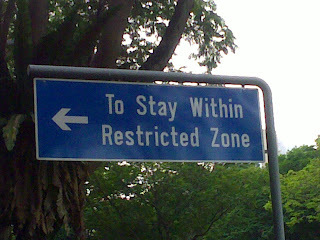 So I never kept real boundaries for the longest time. However, as I get wiser *smile*, I realise the wisdom of respecting boundaries. 1. Being silent about things spoken to me and not share everything I hear to my good friends. 2. Keeping mum for the moment although I want to ask questions about the who, where, what and why. 3. Learning when to let someone in and when to keep someone out so that I don't get emotionally drained. 4. Appreciating the beauty of waiting for the unknown and the unspoken. 5. Respecting others' need to blow up in my face and knowing that this is not going to destroy who I am. 6. Allowing myself time to grieve over lost friendships and not try to save it so quickly like I used to do.